Test Data: 1.41 WDA .58 BF 7.9 LE at 269 lbs. Boardwalk is one super impressive young Berk boar! He has tremendous look and design and is heavy structured and stout boned. He has great feet and legs, high head carriage, extra long and tall front and a level top. This guy is square fronted, square topped and square rumped with excellent top shape and excellent rump shape. He hit us hardest at the 2017 Indiana State Fair and is one of the best, if not the best berk boar, we have seen in 2017. 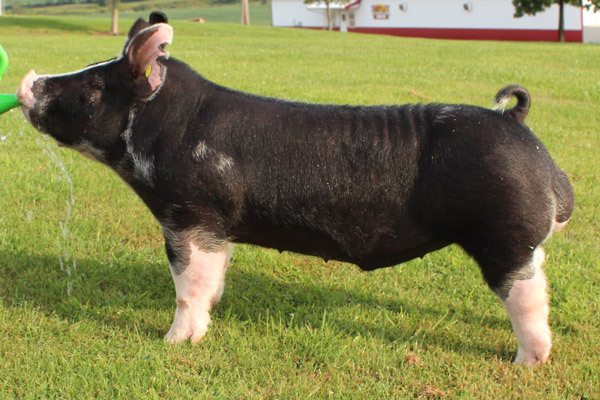 This guy can sire boars, gilts and tremendous show barrows!